Earlier on the Group’s website there were several articles about the Dutch American mining magnate from the Philippines – J.H. Marsman and his firm Marsman HK China Ltd (馬士文公司) which operated the Needle Hill mine between 1936 and 1951, the Castle Peak mine from 1936 to 1958 and the Morrison Hill quarry(except during the Japanese occupation from 1941-45). In the 1950s, Marsman HK was controlled by Joseph Yen (1907-1988), a successfultrader from Tientsin and Shanghai. Despite having made a sizeable fortune and an industrial building named after himself in Chai Wan, Joseph Yen was relatively under the radar until his daughter Adeline Yen Mah (馬嚴君玲) wrote a bestselling tell-all autobiography Falling Leaves in 1997 in which he and his second wife were prominently featured. Rather than repeating the family drama detailed in the book, this article will focus on the business aspects of Joseph Yen’s life, drawing upon multiple sources. Joseph Yen descended from a family of entrepreneurs, starting with his grandfather who operated teahouses in Shanghai. His father C.L. Yen (嚴乾利)was the manager of the Tientsin branch of Wah Chang (華昌,spelled as “Hwa Chong” in Falling Leaves), a leading trading firm and dominant player in the global tungsten business with roots in Hunan province which was the world’s largest source of tungsten. Founded originally in 1896 by the Liang brothers,Wah Changwent through boom and bust during World War I andby 1924 when the 17 years old Joseph Yen joined his father at the Tientsin branch as an office boy after graduation from Catholic middle school in Shanghai, it was controlled by the firm’s US managerKuo-ching Li (李國欽1892-1961), a Royal School of Mines trained chemist (not London School of Economics as stated in Falling Leaves)who became the “tungsten king” and the wealthiest Chinese person in America for close to half a century.Interestingly enough, K.C. Li’s daughter Li Lien-fung (the mother of Banyan Tree Hotelsfounder Ho Kwon-ping) like Adeline Yen Mah also wrote a tell-all memoir (A Daughter Remembers, 2011) about her father and stepmother.Thanks to his fluency in English, Joseph quickly learned the ins and outs of the trading business and was placed in charge of the firm’s import business and handling company correspondences despite of his young age. The biggest business of Wah Chang’s Tientsin branch was not tungsten but ephedrine (ma huang), which was used in the production of pharmaceutical products by big foreign clients such as Bayer. In 1926, KC Li decided to wind down Wah Chang’s Tientsin operations and a number of staff moved to Continental Trading, a trading firm established by Tientsin-based Continental Bank (大陸銀行). The 19 years old Joseph Yen opted to start his own import export business -Joseph Yen & Co (兆孚公司) in the French Concessionwith the backing of his father. The business was also supported by his aunt S.Y. Nyien (嚴叔和, Yen Shu-Ho, born in 1886), a pioneering female banker. A graduate of McTyeire’s Girls School in Shanghai, Nyien was head of the women’s department of the Shanghai Commercial & Savings Bankbefore founding the Shanghai Women’s Commercial &Savings Bank (上海女子商業儲蓄銀行) in 1924 which provided letters of credit for her nephew’s new firm. The business prospered from the start, exporting ephedrine, walnut kernels, straw hats, pork bristles, candle wax and dried fruits and importing bicycles and pharmaceuticals. Yen also expanded to other businesses such as lumber and became an executive director of Tientsin Press Packing Co Ltd (天津打包公司), a leading machine pressing concern jointly owned by the British firm of Pottinger & Co and a group of Chinese merchants. Joseph married Ren Yong-ping, a staff member of his aunt at the Women’s Bank and together they had 5 children. After Ren’s death in 1937, Joseph marriedJeanne Prosperi (包薔娜, 1921-1990), the daughter of a French soldier and a Shandong woman. After the Japanese occupied Tientsin, the business environment in Tientsin became very difficult andthe Yen family moved from Tientsin to Shanghai in 1942-43. After the War, Joseph returned to Tientsin to retake his business. When the Communists came to power in the mainland in 1949, the Yens moved to Hong Kong. 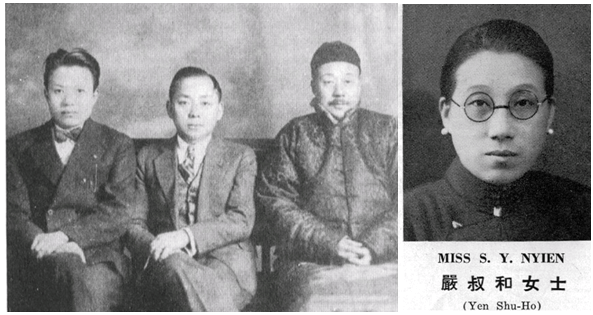 Joseph Yen & Co in Tientsin became a public private enterprise in the 1950s and a 1956 Ta Kung Pao article mentioned that Joseph and Jeanne as overseas shareholders of the firm were able to collect dividends which they gave to his mother to cover her living expenses in Tientsin. In Hong Kong,Joseph quickly re-established his import export business with a rented office in Ice House Street. He also took advantage of the market volatility and made a fortune trading stocks, commodities and foreign currencies. In late 1952, a distressed opportunity arose in HK as Marsman HK China Ltd had fallen on hard times. Marsman HK China was formed in 1936 by Filipino gold mining magnate J.H. Marsman to operate the wolframite mine in the Needle Hill area in New Territories. Aside from mining, it was also a leading construction and engineering concern, responsible for building air raid shelters for the government and godowns for clients such as Kowloon Wharf before the War. During the War, Marsman mines in the Philippines and HK were seized by the Japanese and as a result J.H. Marsman suffered millions in losses. After the War, Marsman HK China resumed its operations and business was good during the 1949-51 tungsten boom with over 5000 workers at the Needle Hill mine at one point. However, by 1952 tungsten price dropped dramatically and coupled with the rise in labor and material costs, Marsman HK China incurred losses of over HK$420,000 in the fiscal year ending April 1952.Board member T.B. Wilson, the manager of the HK branch of American President Lines, stepped in as chairman replacing Marsman with plans to liquidate/sell the firm at the shareholder meeting in December 1952. That’s when Joseph Yen entered the picture, acquired the firm and became its new chairman. The new board of Marsman (for some reason misspelled as “Mazman” in Falling Leaves) included Joseph, his wife Jeanne and his associates Chi-Yan Tang (鄧熾仁), Sing-kong Miao and S.K. Yang. Born in HK in 1912, C.Y. Tang the new managing director of Marsman was a graduate of the University of Shanghai. By December 1953 when Joseph Yen presided over his first annual meeting as Marsman chairman, the firm had returned to profitability. This was achieved in the construction department by not taking on projects such as Tai Lam Chung Reservoir which required huge initial expenditures and by selling the department’s plant, equipment and transport vehicles. The Needle Hill mine, which was leased to Hoong Foo Mining Co Ltd, was returning to profitability with increased production and promising sales in America while mining at the Castle Peak mine was suspended (ultimately the mine was surrendered to the government in 1958, see article). On the trading front, subsidiary South China Building Materials (南華建築材料公司) also registered a profit. The sharp decline in tungsten price after the conclusion of the Korean War in 1954 resulted in Marsman closing the Needle Hill mine in 1955 andin 1956, the Needle Hill mine was sold to Yan Hing Mining (仁興礦務), a firm controlled by Dr. Stephen Hui (許士芬), the second son of the shipping and property magnate Hui Oi-chow (許愛周), who operated the mine until 1967. While Marsman exited metals mining under Yen, it resumed production at the Morrison Hill quarry in HK island in the 1950s. 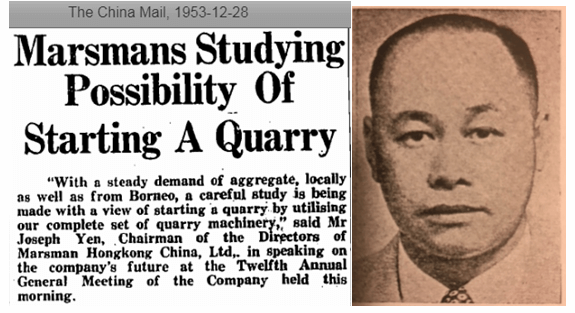 The quarry, which was also referred by local newspapers as the “Marsman Quarry”, was operated by Marsman before the War but by the time when Yen took over the firm, production had suspended and Yen negotiated with the government to resume work leveraging its quarry equipment and experienced staff. InFalling Leaves, it was mentioned that Yen “obtained the rights to dispose of the loose gravel, stone and earth when Stubbs Road was lengthened and widened” and “created a temporary quarry and sold the excavated materials to eager builders” – given the geographical proximity of Stubbs Road to Morrison Hill it is a fair assumption that the author is referring to the Morrison Hill quarry. By 1958, most of the quarrying work was completed, with part of site developed into a primary school by the Tung Wah Group of Hospitals (since 1971 known as the TWGH Lee Chi Ho Primary School) and Marsman tried to evict the 800 workers and families living in squatters around the site by cutting off electricity and water supply. The remainder of site presumably was later developed into the Tang Shiu Kin Hospital, Queen Elizabeth Stadium and the Morrison Hill Swimming Pool. Little info is available about Marsman HK China after the 1950s. According to his bio in HK Album and XianggangNianjian, C.Y. Tang was still managing director of Marsman in addition to being director of Pickford Development (植福建業, incorporated in 1964),South China Building Materials and South China Cold Storage (南華冷房) in the late 1960s. Marsman HK China Ltd was not dissolved as a firm until 2012. Aside from Marsman, Joseph Yen had substantial investments in HK and abroad. In 1957, Joseph Yen gave a talk on investments at the Rotary Club of Hong Kong during which he revealed the secrets of his investment success and his investment preferences. He told the audience that he preferred markets with stable government, plenty of resources and developed industries, specifically the US and Canada and because of the Cold War at the time, the sectors he preferred were steel, rubber, shipbuilding and aerospace. His rules in stock investing were 1) do your homework, 2) stay liquid and do not go short 3) be patient and 4) not be too greedy. In 1957, Joseph Yen incorporated Independent Overseas Investors Ltd with registered capital of HK$100,000. The office of the firm was listed at 25A David House while his residence at 115 The Peak. The firm was renamed Joseph Yen & Co Ltd in 1963 and dissolved in 1990. In 1963, he developed Joseph Yen Industrial Building (兆孚工業大廈) on 24 Lee Chung Street in Chai Wan. This property was later acquired by Henderson Land. In 1964, Joseph Yen formedZenith Plastics Industry in Nigeria to make plastic and rubber shoes in partnership with Kwan-Dai Lee (李关弟, 1909-1998), the Shanghainese proprietor of Hwa Chong Enamel Factory in HK and Nigeria. Joseph Yen & Co was also involved with Zenith Shoe Industries in Bangladesh. According to Falling Leaves, Joseph and Jeanne transferred a lot of liquid assets to Swiss banks during the turbulent 1960s andset up residence in Monte Carlo but returned to HK after the dust settled. In May 1988, Joseph Yen died at the HK Sanatorium at the age of 81. He was survived by his wife Jeanne, 3 sons and 3 daughters – the youngest being Christine Yen Wong (王嚴君琴), the wife of Dah Sing Bank chairman David Wong. This article was first posted on 6th August 2018.